This bowl of chicken ramen is chicken noodle soup taken to the next level. The grilled chicken adds some depth to the flavor of this scrumptious meal, infusing a smoky flavor into the broth. To balance out the chicken, there are plenty of greens, which add a touch of freshness to the dish. And what’s more, there’s half a tea-stained egg with a yolk so shiny it’s worthy to be featured in any foodstagram. This pork ramen is more than just a bowl of noodles topped with pork. A bite of the pork will send a slight tingle down the back of your throat. The bean sprouts and the other veggies add a touch of freshness that will give you a taste of spring to help you forget about the bitter cold outside. The noodles and broth work together so beautifully you’ll want to cry tears of joy upon first slurp. Not only does the restaurant have a large variety of dishes, they also have a range of menu items catered for vegans. One of them, the Kare Burosu Ramen, is a shining jewel. The curried vegetable broth bursts with flavor without being too overpowering and rich. The mushrooms add a punch to this rich flavor, while the tofu that soaks in the soup allows it to be a crunchy flavor bomb. But the real star of this dish are the noodles, which soak up the flavors of all the ingredients while maintaining a texture that’s neither too chewy nor soft. 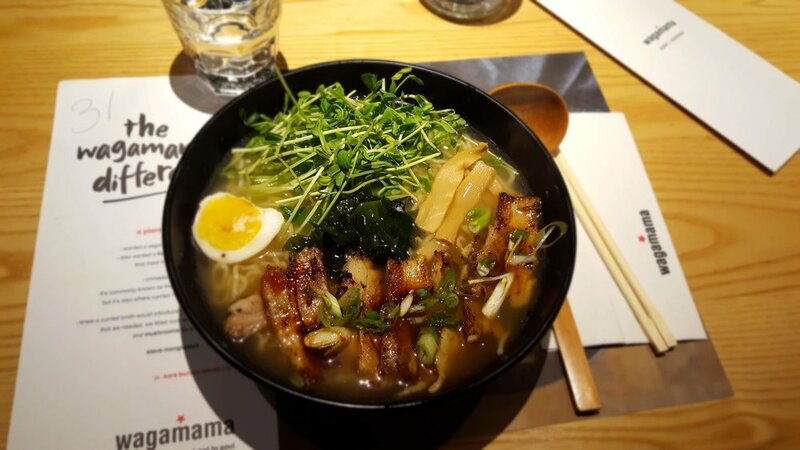 With a versatile flavor palette, Wagamama is worth a visit!